Pope Saint Dionysius was bishop of Rome from July 22, 259 to December 26, 268. He followed Sixtus II, who had been martyred along with several Roman deacons, and was succeeded by Felix I.
Dionysius was elected pope in 259, after the Roman bishop's chair had been vacant for nearly a year following the martyrdom of Sixtus II in 258. After Emperor Valerian I, who had instituted the persecution, was captured and killed by the Persians in 260, the new emperor, Gallienus, issued an edict of toleration, bringing the persecution of Christians to an end and giving the church legal status. Dionysius took on the task of reorganizing the Roman church, which had fallen into disorder during the persecution. He also had to contend with the ongoing Novatianist schism over the question of whether those who committed apostasy under persecution could be absolved of their sin and readmitted to communion. Dinonysius also held an important Roman synod to deal with the suspected heresy of the bishop of Alexandria, also called Dionysius, which helped establish the Catholic doctrine of the Trinity. Pope Dionysius also sent large sums of money to the churches of Cappadocia in Asia Minor, which had been devastated by the marauding Goths, helping them to rebuild and to ransom those held captive. Dionysius reestablished order and confidence in the Roman church, and his papacy began an era of peace with the state that would last until 303, during which time the Christian church emerged as a formidable institution in the Roman Empire. He died of natural causes on December 26, 268. Dionysius' date of birth and family origin are unknown. He is said by the Liber Ponificalils to have previously been a monk. During the pontificate of Pope Stephen I (254-57) Dionysius was a presbyter of the Roman church. During this time, two letters were addressed to him from his namesake, the bishop of Alexandria, in which the African bishop describes him as an excellent and learned man (Eusebius, Hist eccl. VII, vii). One letter dealt with the subject of the "heretical" baptism practiced by the Novatianists, over which Rome and the African churches disagreed. The friction between Rome and the African churches was ameliorated during the papacy of Sixtus II, but what role Dionysius had in this cannot be known for certain. 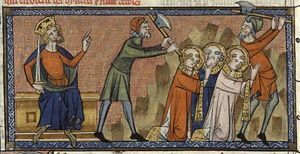 Meanwhile, the persecution of the Christians began again under Valerian I. Sixtus and several Roman deacons were executed, but Dionysius escaped, perhaps very narrowly, as he seems to have been already of some importance in the church's administration. After the martyrdom of Sixtus on August 6, 258, the office of bishop of Rome remained vacant for nearly a year, as the violence of the persecution made it impossible to elect a new head. It is not unlikely that Dionysius played a significant role in the church during these days, although probably not a very public one. Emperor Valerian is shown supposedly directing the execution of Dionysius' predecessor, Sixtus II, and his deacons. The church suffered greatly during this period. Valerian's edict permitted the summary execution of bishops, priests, and deacons. The emperor also aimed to purge Christians from the higher ranks of society, in which the church had made significant inroads. Christians of senatorial and equestrian rank were punished with degradation and the confiscation of their property, followed by death if they refused to offer sacrifice to the gods of the state. Women of the nobility were sentenced to property confiscation and exile. Christians in the imperial household were sent in chains to perform forced labor in distant domains. In addition to the martyrdom of the pope, Bishop Cyprian of Carthage was killed on September 14, 258. Another celebrated martyr was the Roman deacon Saint Lawrence. In Spain, Bishop Fructuosus of Tarragona and his two deacons were put to death on January 21, 259. There were also executions in the eastern provinces (Eusebius, VII, xii). The difficulties of external persecution were matched by the continued strength of the schism founded by the antipope Novatian, who himself became a victim of the persecutions in 258. The Novatianists, who held that those who committed apostasy under persecution could not be readmitted to full communion, had strong congregations throughout the Roman Empire. Given their commitment to resist persecution at the risk of their lives, they probably gained in prestige and possibly in membership (relative to the Catholics) during this time. A further complication for the incoming pope was the division within the Catholic faction over the question of the validity of baptisms performed by Novatianist clergy. Emperor Gallienus ended the persecution initiated by his father Valerian and allowed the Christian church to function as a legal entity. I have ordered the bounty of my gift to be declared through all the world, that they may depart from the places of religious worship. And for this purpose you may use this copy of my rescript, that no one may molest you. And this which you are now enabled lawfully to do, has already for a long time been conceded by me. 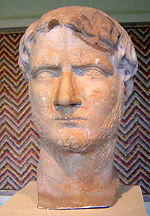 Therefore Aurelius Cyrenius, who is the chief administrator of affairs, will observe this ordinance which I have given. Thus, in the early days of Dionysius' papacy, the Roman church came again into possession of its houses of worship, its cemeteries with their precious tombs of the martyrs, and other properties. During his episcopacy, Dionysius labored to bring the administration of the church once more into good order. The Liber Pontificalis speaks of him assigning presbyters to care for various church parishes and cemeteries, and of his reorganizing the episcopal boundaries of the metropolitan area of Rome. Early on in his papacy, however, a new controversy arose regarding the definition of the Trinity. Bishop Dionysius of Alexandria, in writing against Sabellianism, expressed the opinion that the Son is "something made" and distinct in "substance" (ousia) from the Father, even as is a shipbuilder from a ship. As a result, an accusation of heresy was made against him and laid before the pope, who called a synod at Rome for the settlement of the matter. Dionysius issued, in his own name and that of the council, an important doctrinal letter in which the Catholic doctrine of the Trinity began to take clearer form. The statement condemned the modalistic doctrine of Sabellianism and further rejected those who represented Christ as a created being. However, the pope stopped short of criticizing the venerable Alexandrian bishop by name, sending him a separate letter calling on him to explain his views. Dionysius of Alexandria's Apologia is preserved by Athanasius (De sententia Dionysii, V, xiii, De decretis Nicaenae synodi, xxvi). Here, the Alexandrian protests that he has been misunderstood and declares that Christ is co-eternal with the Father. Rather than insisting on his previous statement, he even anticipates the Council of Nicea in using the word "consubstantial," (homoousios) to emphasize the unity of the Father and the Son. The cooperation established through this correspondence between Rome and Alexandria in developing and affirming the "orthodox" doctrine of the Trinity would play an important role in the later Arian controversy. Following the ancient practice of the Roman church, Dionysius also extended his care to the faithful of distant lands. When the Christians of Cappadocia (in modern Turkey) were in great distress from the marauding incursions of the Goths, the pope sent a letter to the Church of Caesarea together with a large sum of money for the redemption of enslaved Christians. Unlike most early popes, there is virtually no tradition of Dionysius being a martyr. One can safely say that his life ended naturally, having maintained a profitable peace with the Roman state. After his death the body of Dionysius was buried in the papal crypt in the catacomb of Callixtus. Dionysius was one of the most important popes of the third century. He initiated a period of good relations between the Christian church and the Roman Empire and was able to reestablish the effective administration of the church after the disruption of the persecution under Emperor Valerian. He presided over an important synod which enabled the doctrine of the Trinity to take clearer form and succeeded in making Alexandria an important ally with Rome in defining the orthodox position. In art, Pope Dionysius is portrayed in papal vestments, along with a book. He should not be confused with several other saints or bishops named Dionysius or Denis. His feast day is celebrated on December 26. This page was last modified on 19 August 2013, at 14:21.